The NZMeccano 10-set survey is available here. 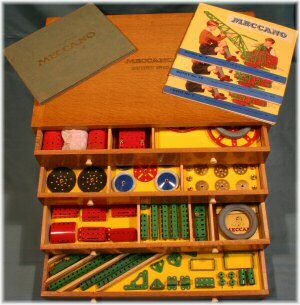 If you are the fortunate owner of one of Meccano's largest outfits, please tell us about it by going to that page! This page shows some of the results of our 10-set survey, from the live data collected so far. If you can think of other information you would like to see (from the data we retrieved), please make a comment at the bottom of this page and we'll see whether it can be added! So far, 460 people have filled in the survey form, describing 751 complete outfits. These people have an average of 1.63 outfits each! As expected, the 'classic' medium red/green presentation cabinet is the most common, as it is seen as the definitive No.10 set, even by Meccanomen who were brought up on later colour schemes. 201 outfits (26.8%) have a key! No surprises here, with eBay taking over as the primary source of Meccano outfits in the last decade. Meccano club members, friends, and Spanners make up the most common sources for more recently purchased outfits. What this chart does show us is that a large proportion of outfits have changed hands in the last few years. Note that outfits where there was no purchase date, or no source information, are not shown in this chart. As expected, the most common 'built up' outfit by far is the medium red/green. Original nickel outfits surprisingly show only one entry. The unusual 'mixed colour' original outfit is an export one which was supplied in a mixture of medium red/green and light red/green. Click on the Outfits tab at the top of the page and you will see at the bottom of the list that pops up "Parts List Generator". Select the year and outfit size and a list of parts will be generated which you can copy into Excel or Word and then print off. I have just bough a Set 10 privately through your site and it seems to be 99% all new parts. How can I check if it is 100% complete? Forgot to mention I also own a pristine 1970's No.9 Outfit in it's original wooden box with the poly inserts and all the manuals. I also own a complete run of red/green outfits from 00 through to 9, a No.8 Gold/blue hatched set, Elektrikit, Mechanisms & Gears Outfits, plus a run of late 60's sets from Play Set through to Breakdown Crew Set. And a couple of Accessory Outfits thrown in for good measure, a late 1950's 8A and a mid 50's 1A plus loads of loose parts! Is there a record of the names of those who have taken part in the survey. I took part in the original Spanner survey but am not sure if I added my two No 10 sets to this one. I do not want to distort the figures by taking part twice.